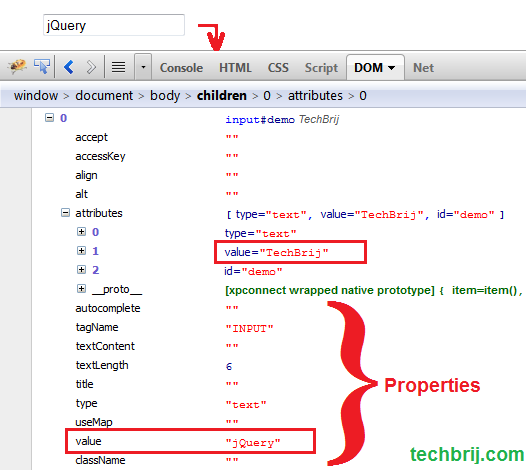 You see Property “value” is ‘jQuery‘, but Attribute “value” is still ‘TechBrij‘. Now you have got idea what it means. Only element’s property is changed, because it is in the DOM and dynamic. But element’s attribute is in HTML text and can not be changed. In wide sense, the property always represents the current state while the attribute (except in old versions of IE) represents the initial state or is meant for html attributes as they are strictly defined. the attribute tells you nothing about the current state. 1. selectedIndex, tagName, nodeName, nodeType, ownerDocument, defaultChecked, and defaultSelected..etc should be retrieved and set with the .prop() method. These do not have corresponding attributes and are only properties. prop method returns Boolean value for checked, selected, disabled, readOnly..etc while attr returns defined string. So, you can directly use .prop(‘checked’) in if condition. For jQuery 1.6+, prop will be mostly used because it is simple and wider than attr. In most old projects, attr is used to get current state information of element. But now prop has taken this job and attr would be replaced with prop. Hope, It helps. Share your opinion in comment box. Nice but it would be great if you extended this to rovmee target=”_blank” from internal links, just in case they have them turned on. Shouldn’t be hard, just a simple if else statement, but I’m sure someone would find it useful. Greetings thanks for great put up i was browsing for this issue last 2 days. I will look for upcoming valuable posts. Have entertaining admin. I just want to tell you that I am just newbie to blogging and seriously loved your web-site. More than likely I’m planning to bookmark your blog post . You absolutely have fabulous article content. Kudos for revealing your webpage.